In this link you will find your results given against your roll number and name. Plus your category ( general, SC,ST) will be mentioned in the report card and your total marks obtained will be indicated alongside your category and overall rank. The S.NO. is to be used as an indication of the number of students who appeared for the exam. The Roll no. can be used to search your results in the large database of the result. The name along with roll no. is an indicator which you can use to search for your DU LLB Results in the huge results database. The category is mentioned firstly so as to help you identify your details from the large database plus to facilitate calculation of whether you have been selected on the basis of reservation. Next comes your total marks. This mark should be equal to or above the cut off marks for you to get selected. Then is the category wise rank which is different from overall rank. Since there is reservation for various categories such as for scheduled caste, scheduled tribe, other backward classes, persons with disability, wards and widows of armed personnel including para-military forces, and foreign nationals so it is important to display different ranks for those covered by reservation. If you have a curious mind and wish to know the factors that affect the decision of what the cut off would be for a particular year then I have made a list of following factors which determine the cut off. Last of all comes the question of how to go for a tie breaker. It is quite possible that few students have the exact same score. So, the student who scored more in the qualifying exam would be given preference. If the marks in the qualifying degree exam is also the same then age would be taken into account. Student who is elder would be given priority. If the age also is the same then the tie breaker would be done by a draw of lots. 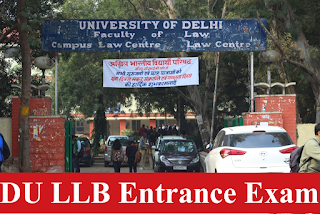 After the DU LLB Results are announced there will be publication of a merit list and the same would contain the list of category wise and general list of rank holders and this merit list is the basis on which students would be called for counseling. There will be as many as six rounds of counseling before the admission process comes to an end. The total seats available are approximately 1790 out of which seats for the open category are 1167 and for reserved category are 623 seats. Last year the total number of seats was 2611 out of which 301 seats were for reserved category. The participating colleges are Campus law centre, law centre 1 and law centre 2.